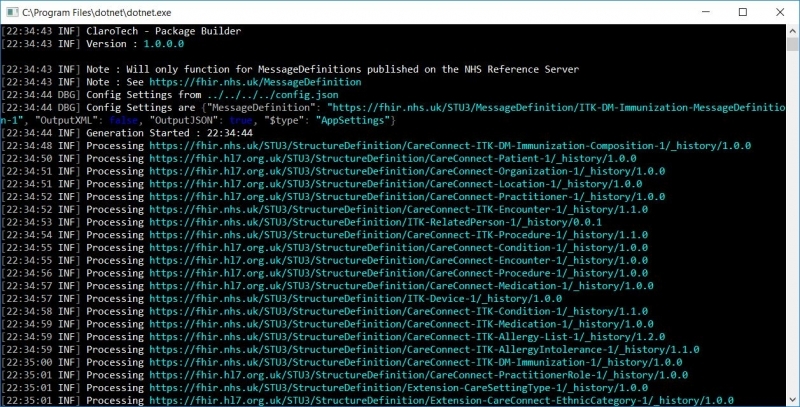 The FHIR Package Builder tool will create a ZIP file of all the FHIR Assets listed within an NHS Digital style Message Definition file. The ZIP file will contain the following types of assets. The package created can be configured to have the assets included either as XML files, JSON files or both. The tool requires a simple configuration file, an example of which is shown below. The full URL of the message definition file that the package is to be built from. (Note – As this is driven by NHS Digital style Message Definition files, it will only work for them). The tool has been developed using .NET Core. As such it should run on any operating system that supports .NET Core. For ease of use it has been published as a Windows 64 bit executable. This is the output of the processing required to build the package file. If any errors occur details will be within this file. The recent releases of the application include the following enhancements and fixes. Initial version of the tool.